Ketchikan has been coined as the “First City” because it’s the first stop for cruise ships coming from the South. From doing a bit of research before our trip, we concluded that Ketchikan is the ideal place for two things: fishing and shopping. While the idea of casting my net out into the majestic Alaskan sea sounded appealing, the harsh reality of catching and then subsequently clobbering a fish to dead just didn’t interest me. Maybe that makes me a hypocrite because what does interest me is indulgencing on freshly caught seafood. 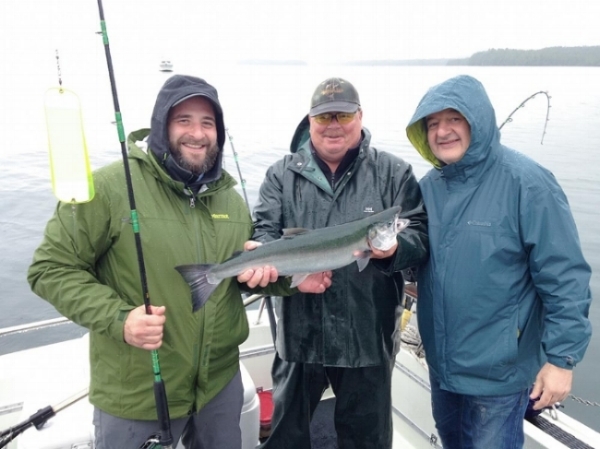 After a long days work, they ended up catching two different types of salmon and halibut. They found a company to clean, process, and ship the frozen fish home so our freezer is now stocked up for the next couple months. The shopping was plentiful. When you first step off the ship it seems like you are bombarded with souvenir shops, which not surprisingly sold almost the identical merchandise. There were a couple shops closer to Creek Street that I found some cool gifts and souvenirs. There is a rather large Russian population in Ketchikan so there were several Russian gift shops all with beautiful collections of Matryoshka Dolls or Nesting Dolls. Dolly's House Museum - Sadly i didn't have time to check it out but it's a museum about the only still standing brothel in town. It's only $5 to get it so maybe worth a visit. Great Alaskan Lumberjack Show – Unfortunately we didn’t have enough time during our visit to go see it, but if you love men bearded men wearing flannel and chopping wood, this is the place to be. Totem Bight State Historical Park– 33 acre state park in North Ketchikan. Totem Heritage Center Museum – . The Heritage Center houses one of the world's largest collections of 19th century totem poles. Alaska Fish House - if you are craving seafood (who isn't while in Alaska) check out Alaska fish house. The Asylum Bar - OK so I can't vouch for the food but it's a fun spot. Plus they have free wifi.